Today marks the 60th anniversary of the launch of ABC television. 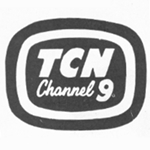 ABC’s first station to go to air was ABN2 in Sydney, operating from studios and a temporary transmitter based at Gore Hill in Sydney. However, construction at Gore Hill was not completed in time for opening night — leading the ABC to utilise its orchestral studio in Kings Cross (connected to Gore Hill via the ABC’s new outside broadcast van) and a makeshift studio, the ‘Arcon’, which was a storage shed on the Gore Hill site. Charlton’s introduction was significant as it was his father, Conrad Charlton, who was the first to announce the introduction of ABC radio in 1932. The opening formalities at the Kings Cross studio continued for 45 minutes, with Charlton introducing guests including Prime Minister Robert Menzies, the Postmaster-General, Charles Davidson, Senator Nick McKenna representing the Leader of the Opposition, Dr H V Evatt, the BBC‘s Director General, Sir Ian Jacob, ABC Chairman Sir Richard Boyer and ABC’s General Manager, Charles Moses. Very little else seemed to go to plan — including at one point an oblivious Charlton being seen smoking a cigarette as a stage hand carried a table off the set. “You’ve caught us on the hop a bit,” he explained as he waited directions from the producer about what to do next. Later in the evening it was over to the Arcon ‘studio’ for the play The Twelve Pound Look, starring Margo Lee, John Brunskill, Joan Lord and Alexander Archdale. The production was a very modest affair, coming from the very small temporary studio, but went ahead without a hitch. Next up was an American comedy, My Hero, followed by the first episode of BBC series War In The Air. Opening night for ABN2 came to a close with a 20-minute film, This Is The ABC. 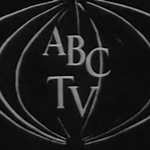 The 1955 documentary looked at various aspects of the ABC’s activities and program production, but it was all pre-television. It was another two weeks before ABN2’s sister station in Melbourne, ABV2, was officially opened. 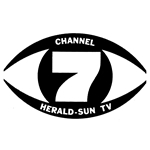 The advent of ABV2 ensured that the ABC could provide coverage of the Melbourne Olympic Games, but with no direct link between the two cities Sydney viewers could only watch filmed highlights rushed up from Melbourne. 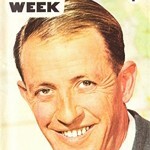 Michael Charlton went on to have a very successful career with ABC, including hosting the current affairs program Four Corners and winning a TV Week Gold Logie in 1963 for Most Popular Personality on Australian Television. James Dibble, who introduced the opening night broadcast, went on to read the news for ABC in Sydney for almost 30 years before retiring in 1983. Source: Sydney Morning Herald, 6 November 1956. The Age, 6 November 1956. 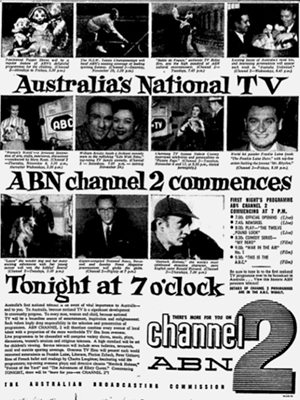 Australian TV: The First 25 Years, Thomas Nelson Australia/Cinema Papers, 1981. Aunty’s Jubilee: Celebrating 50 Years Of ABCTV, ABC Books, 2006. Those Fabulous TV Years, Cassell Australia, 1981. 50 Years Of Television In Australia, Hardie Grant Books, 2006. ABCTV At Gore Hill.